At Valley Forge Military Academy & College (VFMAC), we respect and are committed to protecting the privacy of all cadets, staff, faculty, alumni and families related to the organization. The identifiable personal information you provide through e-mail lists, website forms, login portals, and surveys is considered private data. The data may be shared with employees of VFMAC as necessary to provide the specific service requested, but no personal identification information is ever shared with other organizations, advertisers, or other third parties without explicit permission. What data does VFMAC collect and what do we do with that data? Based upon the type of visitor, we collect different data from you based upon your needs. We want to learn from your visit in order to improve your experience. Our users include casual users (base level users) and VFMAC Staff. Staff are defined as teachers, administers, individuals applying for an employment position, and other employees of Valley Forge Military Academy & College who visit our site on a regular basis and agree to set up an account. VFMAC Staff has a higher level of access to VFMAC data. Whether you are Staff or casual visitor, VFMAC is dedicated to protecting your information and respecting your privacy. VFMAC Staff who create an account will be releasing to VFMAC their name, position and department at the school, email address, and phone number. VFMAC will be collecting this information in order to improve our services to better serve you and potential users. Your email address will be used to assist in your return to VFMAC if log in and/or password has been forgotten. Your email will also be used to inform you of important information regarding VFMAC (only if you provide consent to receiving such information). VFMAC respects member privacy and members may opt out of receiving information from VFMAC if they desire to do so. VFMAC will collect data from our Donors such as: donation amount, billing information (first name, last name, address, city, state, zip code, country and email address). We will also collect payment method information such as credit card, bank account information (if you select this option) and/or pay pal account info. The information gathered from VFMAC donors will be used to process billing information. The email received will be used to send you additional information and/or receipts for tax purposes if you decide not to use regular mail. VFMAC will collect data from our technology partners such as: company name, address, city, state, zip code, country, email address, point of contact and type of educational service offered. In addition, there will be the ability for the technology partner to upload a technical proposal of potential educational services offered to VFMAC. The information gathered will be used to contact technology partners directly for in-person interviews and provide contribution receipts for tax purposes. Cookies will be created and stored in order to allow repeat users from re-entering passwords to their account. Storing a cookie on our website will allow users to, not have to enter a password more then once per session. If VFMAC users do not allow the cookie they may still use our website. VFMAC will collect traffic numbers in order to identify the volume of visitors to our site. We will also be recording the time of your stay and what webpages you visited. This information about traffic pattern and use will be collected to improve the user experience on VFMAC website. To whom does VFMAC share the information collected and how is it protected? VFMAC will not share any traffic patterns, user records and information to any other entity beside VFMAC. The VFMAC Staff data collected will only be used for VFMAC services and not released to the public. All Staff data will be protected by the highest encryption methods both data in transit and data at rest. VFMAC maintains a record retention and data destruction policy to ensure data at the end of the calendar year will be permanently destroyed. VFMAC Staff may request copies of VFMAC audit data on our security practices, which will demonstrate how we protect and secure your data. In the event a data breach occurs, the entity will be notified prior to any mandated public notification. Donors, Technology Community members, Educator providers/contributors may wish to display their information about their services on pages specified for them, but are not obligated to do so. VFMAC will not share Donor information other than the aggregate information needed for IRS reporting. Sponsor and founding donors can request VFMAC to advertise their status as a donor, having their information reported on our website. In regard to potential employees, VFMAC takes great measures to protect private information and will not release any information received to the public. Only VFMAC recruiting staff will use the data you submit to consider you for a job. Resumes will be retained for one year and destroyed after one year, unless hired. What kind of communication should I anticipate from VFMAC? VFMAC Donors and Staff may receive emails with new promotions, benefits and other services in regard to their membership. Opting out of our email notifications will be possible. VFMAC is committed to ensuring the safety of the website and its users. This site has security measures in place to protect information that is under our control. The network infrastructure is protected by a firewall and traffic is monitored and logged both on the firewall and on the servers. All administrative activities are carried out over secure, encrypted links. VFMAC students may be the subject of photographs and other multimedia publicity and/or promotional materials, and as a VFMAC Cadet, he/she waives any rights with regard to the Cadet’s picture or likeness as well as any compensation for such exposure. All materials on this website are copyrighted by Valley Forge Military Academy & College, unless otherwise indicated. VFMAC will not post copyrighted material without written permission from the appropriate parties. For permission to use any material from this site, please contact the Department of Marketing & Communications for VFMAC at pr@www.vfmac.edu. VFMAC use third-party advertising companies to serve ads when you visit our websites. Some of these companies may use information (not including your name, address, e-mail address, or telephone number) about your visits to our websites and other websites in order to provide advertisements about goods and services that may be of interest to you. To learn more about this practice, its benefits, or how to opt-out, see http://www.networkadvertising.org/managing/opt_out.asp. All Rights Reserved. All material appearing on the Valley Forge Military Academy and College website (“content”) is protected by copyright under U.S. Copyright laws and is the property of Valley Forge Military Academy and College or the party credited as the provider of the content. You may not copy, reproduce, distribute, publish, display, perform, modify, create derivative works, transmit, or in any way exploit any such content, nor may you distribute any part of this content over any network, including a local area network, sell or offer it for sale, or use such content to construct any kind of database. You may not alter or remove any copyright or other notice from copies of the content on Valley Forge Military Academy & College’s website. Copying or storing any content except as provided above is expressly prohibited without prior written permission of the VFMAC Foundation or the copyright holder identified in the individual content’s copyright notice. For permission to use the content on the institution’s website, please contact webmaster@www.vfmac.edu. 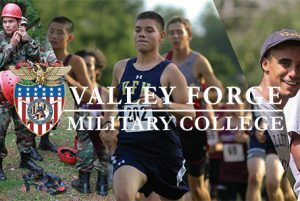 The content contained in website of Valley Forge Military Academy and College (VFMAC) is provided only for educational and informational purposes or as required by U.S. or P.A. law. The institution attempts to ensure that content is accurate and obtained from reliable sources, but does not represent it to be error-free. VFMAC may add, amend or repeal any policy, procedure or regulation, and failure to timely post such changes to its website shall not be construed as a waiver of enforcement. Valley Forge Military Academy and College does not warrant that any functions on its website will be uninterrupted, that defects will be corrected, or that the website will be free from viruses or other harmful components. Any links to third party information on the institution’s website are provided as a courtesy and do not constitute an endorsement of those materials or the third party providing them.